Former President and now Speaker Gloria Macapagal Arroyo visits Thursday the socialized housing beneficiaries at the New Bilibid Prison in Muntinlupa City. The beneficiaries, some 8,000, were given temporary ownership of the properties for an initial period of 50 years. 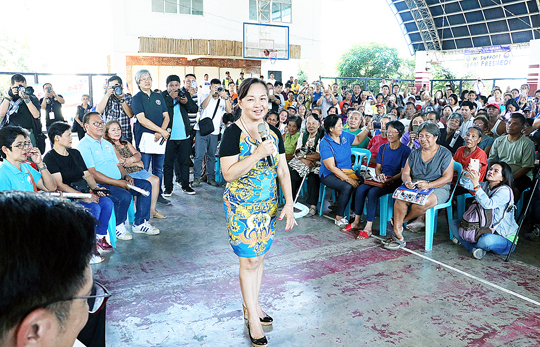 Arroyo announced that, with Rep. Rossano Rufino Biazon and former Housing Secretary Michael Defensor, she will call for an oversight meeting to extend the usufruct in NBP for the benefit of all the constituents. Also present were Muntinlupa Mayor Jaime Fresnedi and Barangay Poblacion chairman Allen Ampaya.